A few years ago Rick Schreiber, also an accomplished architect, told me this story about his father Charles. I’m not sure this is documented anywhere else. So in the spirit of getting this bit of social history down in black and white, as it was told to me, here goes. The Schreiber brothers were born in 1915, trained and practiced in Chicago, came to Phoenix as adults in 1949. Charles had been born about fifteen minutes before Art and he kept it that way. Some of their one-off custom houses occasionally pop up on the market. In fact Scott still has their lovely 1962 Casa de Luz in Marion Estates documented here on his site. But mostly the Schreibers made their reputation as developers’ architects, made more money than most architects, and came to their high modernist style not from a fiery intrinsic stylistic need bubbling up from their souls but because they sold well. And they built the Arizona Manor, that hideaway for certain gentlemen from Vegas. Around 1958 the brothers landed a 10-year partnership with Del Webb, who had also already done legendary things in Vegas but was still a real flesh-and-blood human being. Not yet a deathless corporate personage. The Schreibers were his architects for the original Sun City development. A few standard designs over and over; a very good gig. A shrewd offhanded business proposition on a slow summer sales day in Sun City (“Why don’t you just put us on a royalty basis and cut down on the paperwork? How about $250 a house?”) brought the Schreiber brothers financial security in a hurry when the brand’s mass-production model took off. Webb also took them along to Sun City Florida. As if that weren’t heady enough, in the same era the brothers made friends with the Phoenix engineer and entrepreneur Gilbert Olson, of the Superlite Block Company. As of summer 1960 Superlite advertised that their block factory just west of Central, with twelve Besser block machines working 24 hours a day, wasn’t meeting demand. So they were working four more machines in Tempe. Around that same time Olson came to Charles Schreiber with a prospect. A big one. In Hawaii. So that’s what led Rick Schreiber, maybe 16 or 19 years old, and his Dad into the top floor of a building in Honolulu. They saw this: a long, polished conference table with a row of executives along one length, all facing a lone figure on the other side. On the other side was Henry J. Kaiser. Kaiser was maybe 77 and his history already included building Hoover Dam, Bonneville Dam, and that whole winning-World-War-II-with-Liberty-ships thing but, in Rick’s words, still active in his global web of businesses and “still operating like a 30-year-old”, quick-minded, virile, sharp. His edge had always been determined speed. The row of executives represented Kaiser’s various interests in Kaiser Steel, Kaiser Aluminum, Kaiser Motors still producing cars in Argentina and Jeeps in the U.S., Kaiser-Permanente, his worldwide shipping operation, his own banking and financial operations, cement, engineering, broadcasting, on and on. These were all powerful men in their own right. As Rick and his Dad silently took their place at the end of the table, feeling small, Henry J. Kaiser gave Rick a display he never forgot. He worked his way through these executives, gesturing with his cigar, probing each for unspoken issues, correcting their math, playing one against the other, tactically losing his patience, behaving like an industrial titan. Eventually Kaiser’s attention turned to this… architect and his boy. Charles Schreiber slid a 13-page architectural contract across the table and probably said the name Del Webb once or twice. In a calmer moment it came out that, after years of careful maneuvering, Kaiser had wrestled away 6000 acres of land from the Bishop Estate. Land was extremely tight on Hawaii. The “Big Five” had a lock on the real estate market and they weren’t letting go. “I’m not smarter than you are,” Kaiser said, “I just know something you don’t.” Part of his master plan was the dredging of Kuapa Pond for a private marina, everybody knew that. But the simple, stunning sleight of hand was this: Kaiser was going to set up a temporary factory on site to process the dredged-up rock and stone and coral into block. Free materials, on site. No imports. No trans-Pacific shipping costs. That’s where Olson’s block-making expertise came in, and where the margin came from that made the project lucrative. 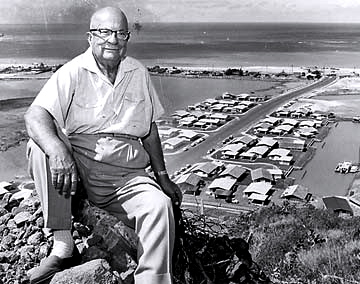 And that’s how Charles Schreiber spent two or three years under Kaiser’s wing, up before breakfast for extended tours up and down the jagged black volcanic slopes in a custom-welded elongated shocking pink jeep, driven by a silent black chauffeur, knocking out eight thousand houses everybody knows as Hawaii Kai.